Our school district hosted a Transportation Fair this weekend and to say it was a hit it a BIG understatement. Every morning, he watches the "Oool Bus' drive by. 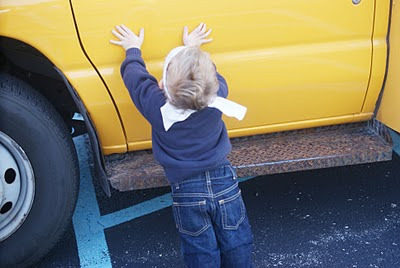 Saturday, he not only got to TOUCH the school bus but go inside! I think I heard him say, 'Ooooh' and "wow' repeated at least a hundred times. 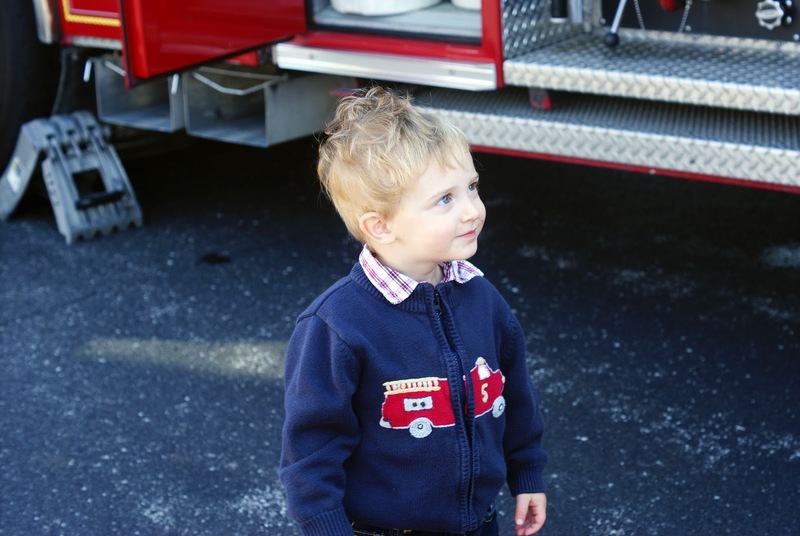 Um, talk about getting choked up watching your toddler walk down the aisle on a school bus. He climbed in the seat, patted it and asked me to sit next to him. Then, my heart exploded. He sat there like he rides the bus all the time. He loved every second. I thought I would have to drag him off kicking and screaming but when he found out there were OTHER things with wheels, he was eager to get a move on. Somehow we had to make a second round to all the trucks and he climbed into the drivers seat. I had a mini panic attack thinking of him driving one day. Mommy is not too sure of that idea ever. He walked around in a daze of wonder and excitement. Then, the firetruck and ambulance had to leave for an emergency and I have never seen the kid sit so still. 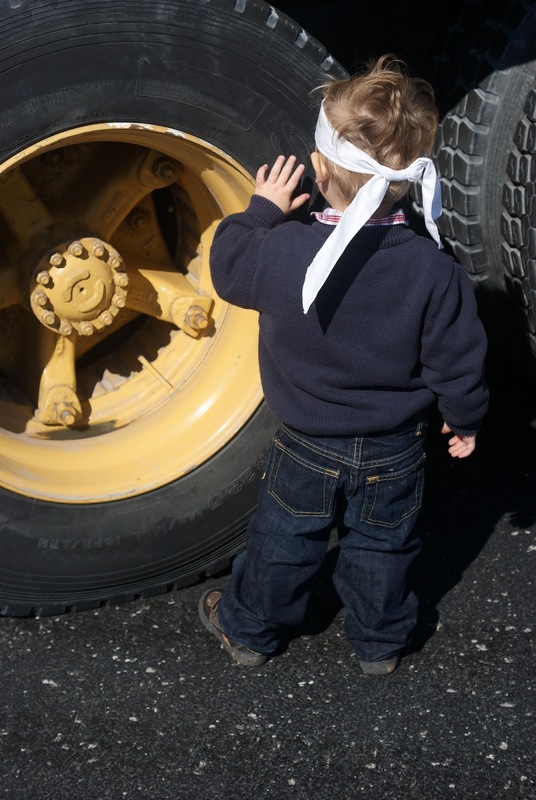 The tires were bigger than he was and just touching them was so exciting! Then, he sat up like this and there was an emotion inside of me that I could not define. 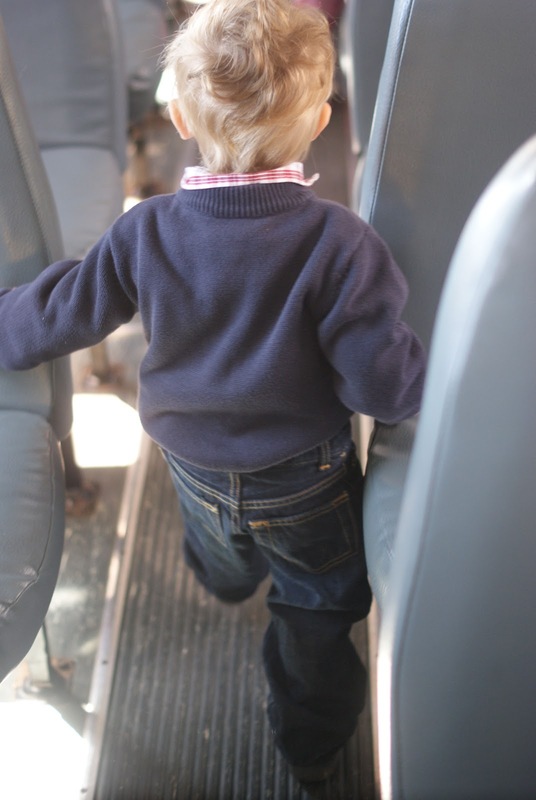 I could picture my baby boy as a school aged kid, riding the bus with his friends. 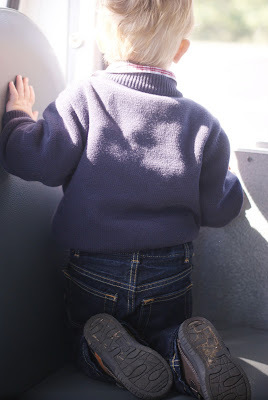 In a month, he'll be two and before I know it, he'll be old enough to ride a bus like this. So, we took seize of the day. Spent our waking hours outside and a trip to our favorite park. He pointed at all the horses and called them, "Annie!'' Nana has horses and a Donkey named 'Annie' so every horse he sees bears the name 'Annie,' well, except for the giant horse (Daddy!) and the miniature horses who were all named, baby! I often wonder where time went and how my baby grew up so fast. I watched his eyes light up as he went down the slide and back down again and again. Days like this I wish I could bottle up. That looks like so much fun! Kelan would have loved that too! 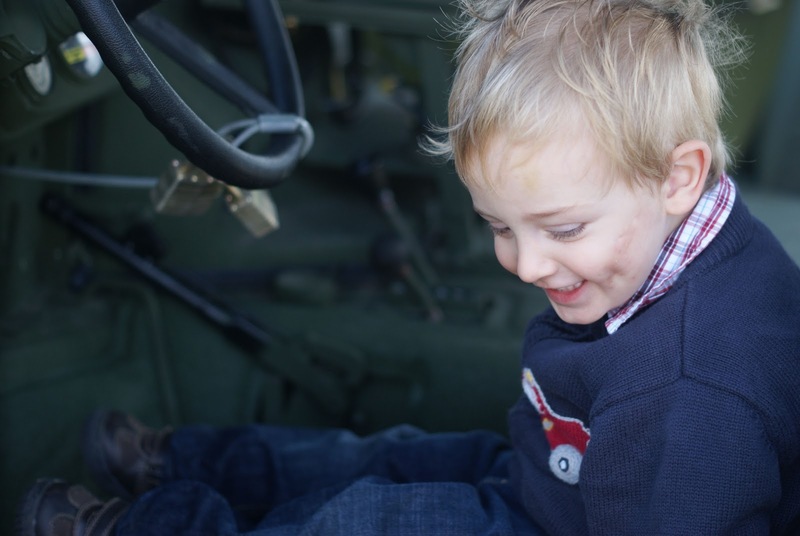 He is absolutely obsessed with any kind of vehicle - espeically the big ones though! Aw, these pictures are so sweet. It's so cute that he got so excited to just go on a school bus. I can understand why it was emotional to see him on the bus.